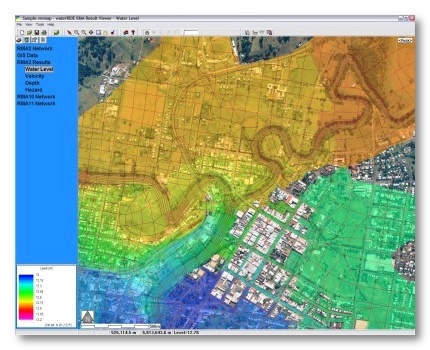 RMAviewer provides a dynamic link between the results of RMA-2, RMA-10 and RMA-11 and GIS packages (eg MapInfo and ArcView). 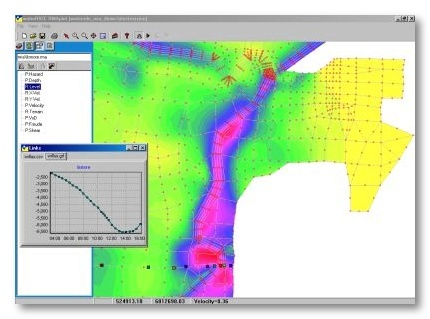 It was designed specifically to bridge the communication gap between modellers and non model orientated decision makers by greatly enhancing the visual appreciation and understanding of RMA model results. 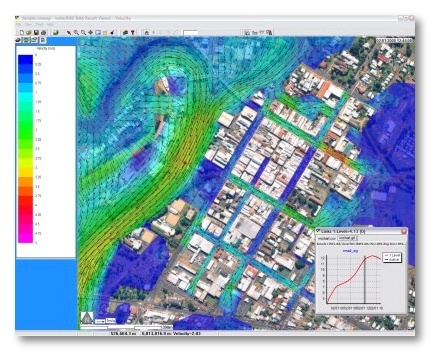 RMAviewer allows the temporal and spatial results of RMA models to be shown against realistic GIS data. RMAviewer can display RMA model results embedded with dynamic data access (thematic surfaces, time and profile views, 3D vertical slices) together with GIS layers such as cadastre, topography, aerial photos and property data bases. It is very distinct from traditional GIS tools because of its ability to show time varying spatial data in a live GIS environment. 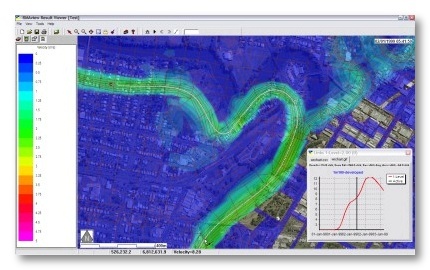 RMAviewer can also export your model results into your external GIS application. Built on the waterRIDE™ framework, RMAviewer allows projects to be developed with an intuitive Table of Contents (ToC). Such projects allow RMA modellers to share their model results with “non-modellers”, without the need for any RMA modelling skills, nor any RMA software installed. 3D vertical slices can be animated! Standard waterRIDE™ linking to external files (refer visionMAKER™ page for full details). 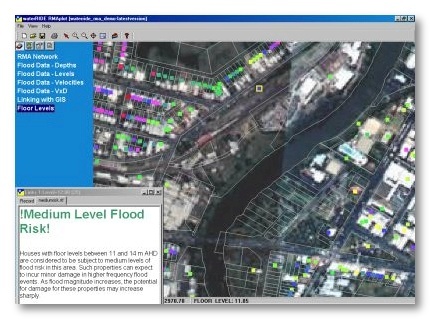 Utilising waterRIDE™’s external file linking capabilitiy, pre-assigned GIS field values can be linked to external files (text, photos, graphics, charts, videos, PDF’s, spreadsheets, etc) which are displayed in a window when the associated GIS element is clicked. A vertical 3D cross section (slice) can be taken through the active results set, enhancing visualisation and understanding of 3D model results. The slice can be even be animated! Use hydraulic results to track the path of a particle through your model. Track the particle in its entirety or take control and track it through as your model results update. Move the particle at any stage of tracking. Export particle path to GIS. With a single click, access all result items at any location in your model results. Run a range of statistical tools on your time-varying model results. Calculate mean, minimum, maximum, and percentiles at any location as a summary table. Prepare a thematic surface across your entuire model domain of exceedance percentiles. 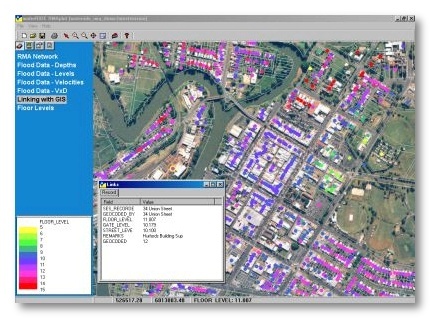 RMAviewer can also integrate with GIS datasets saved as MapInfo (MIF/MID) and ArcView (SHP). Clicking on a highlighted GIS element when the GIS layer is active brings up the associated record attributes. A selected field in a GIS table can also be displayed as a thematic layer coloured by custom palettes in accordance with a range of values or a list of categories. You can also export your model results to an external GIS (such as MapInfo or ArcView). Time varying flow data across any user defined cross-section in the model network can also be displayed both graphically and in tabulated form in a separate window. A time series of any data type at any number of locations can be displayed in graphical and tabulated form in a separate window. 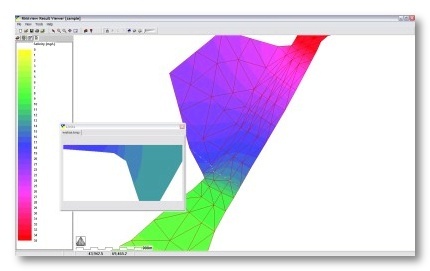 Derived values are automatically calculated such as flow, flow area, and mass flux. This data can be saved as a comma separated value (*.csv) file for use in a spreadsheet. Profiles along any selected alignment can be displayed and animated. Save your profile locations – ideal for model calibration or comparison. Additional tools appear if the RMA dataset is time varying. Simply play, pause, go forward or back. Alternatively select the peak (at each node) surface for the active data type. Animation goes beyond just playing an AVI file. At any point during the animation you can interrogate the model results or GIS layers. Pause, zoom in, read the surface and continue animation. Velocity vectors can be displayed on the map overlaying any other data surface at the location of the nodes and mid-side nodes of the RMA network and also in a regular grid across the entire thematic surface. Animation and peaks also work with the vectors. Any of the data types present in the RMA file can be displayed as a thematic layer. 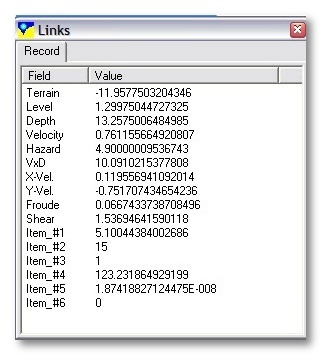 Derived data, eg; velocity * depth, Froude No., hazard categories and bed shear can also be displayed. Roam over the map to see the coordinates and the surface value in the status bar. Setting the active surface is as simple as selecting the parameter, the range and contour interval and selecting a colour palette. Translucent thematic mapping allows you to see through your model results to underlying layers. Information can be accessed in different views established by the modeller and structured like a Table of Contents (TOC). Simply click on an entry in the TOC to bring up a predetermined view and access a combination of layers. Zoom, pan around and interrogate the active surface at will to uncover the story behind the data. The TOC provides a simple and quick way of returning to important preset views of the model data. RMAviewer supports the following file formats with no conversion required. 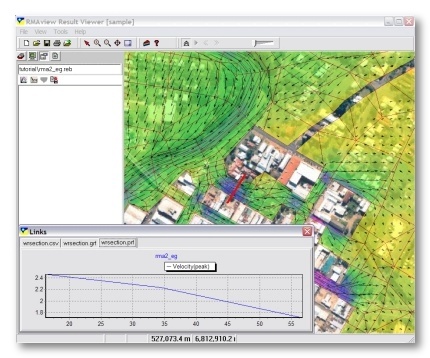 RMAviewer is designed to be used by RMA modellers, as well as non-technical users of RMA model results. RMAviewer is available as both standalone and network (LAN/WAN) licenses.